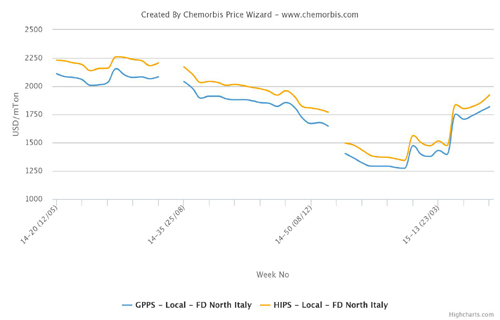 European PS sellers are seeking increases of up to €30/ton for June in regional markets as per ChemOrbis pricing service. Although these hike requests find support from a similar increase on new styrene contract settlements before rollovers were reported on FCA basis, buyers are resisting the recent levels citing their low margins. 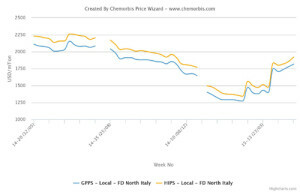 According to data from ChemOrbis, Italy’s PS market has been on a relentless bullish trend since the beginning of April. Converters are lamenting that they can hardly reflect their rising costs to their end product prices. A distributor in the country confirmed, “We are selling good volumes in the polyolefins market whereas the styrenics market is not absorbing price hikes. Some converters are even experiencing production issues as new PS prices are too high for them to buy.” A trader offered rollovers for West European PS materials citing extremely weak demand despite tight availability. “PS supply is short and producers are applying a new round of hikes now. We previously expected a price relief as prices are decreasing in Asia and current offers in Europe are really high. However, we are not sure now about any reversal soon,” a buyer highlighted. “Overall PS trade is slow while supply remains limited. Hence, we expect prices to hover around the prevailing levels througout June before turning down starting from August-September considering lower Asian costs and European summer holidays,” players opine. A container manufacturer reported that they had to purchase recycled GPPS given the stable to firmer trend for June. “Our end business is not that strong,” he noted. “We are offered €30/ton increases for West European cargos this month. We are yet to purchase any volumes to see whether sellers will trim their offers or not in the days to come,” a packager in Germany mentioned. Meanwhile, new PS offers for West European origins were revealed with €10-20/ton increases in nearby Turkey, according to ChemOrbis. Traders who started to offer material in accordance with the guidelines from their suppliers admitted seeing low buying interest ahead of elections this Sunday in the country and nearing Ramadan.